Bell & Gossett - Pumps & Circulators - Memphis Control Center, Inc.
internally flushed Viton/carbon-silicon carbide seal provide an optimum worry-free pump design to 225ºF. Optional EPR/carbon-silicon carbide is rated to 250ºF. Maximum pressure is 125 psig. Bell & Gossett Series 60 circulating maintenance-free in-line mounted pump is available in pipe sizes from 1” to 3”. and motor sizes from 1/4 to 3 HP at 1750 RPM. Available in bronze-fitted and all-bronze construction. Flows to 200 GPM and heads to 55 feet. 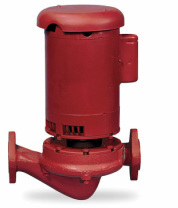 The Series 60 is a maintenance-free pump and motor design. This design provides a worry-free, install-and-forget operation. The design incorporates the patented XL-11® precision-crafted bearing system. Advanced fluid passage design and a permanently lubricated motor provide effective and quiet operation. The hydraulically balanced impeller and resilient motor also help provide smooth, quiet operation. Series 90 a truly worry-free pump. lead-free bronze body construction. Operating Data: Maximum working pressure 150psi, Maximum operating 225F. Advanced close-coupled design increases pump life and efficiency, assures dependable seasonal start-ups and can easily handle difficult water conditions. Tough, durable seal system features a carbon/silicon carbide seal on a stainless steel shaft sleeve for long life and rugged operation.